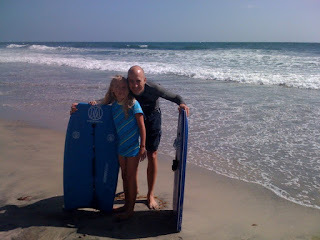 Had fun with Celeste this afternoon at Carlsbad State Beach - she took her first stab at bodyboarding (I've also called it "California Sledding"). She really enjoyed it - was squealing in delight as the waves pushed her to shore. But after one incident where the board slipped out from underneath her, making her tumble in the wash, she was done for the day. Note - put surf wax on her board next time. And don't send her out on a bigger wave.